(Rick Egan | The Salt Lake Tribune) Mitt Romney gives his victory speech, at the Romney Headquarters, in Orem, on election night, Tuesday, Nov. 6, 2018. (Rick Egan | The Salt Lake Tribune) Mitt Romney makes his way to the stage to give his victory speech, at the Romney Headquarters, in Orem, on election night, Tuesday, Nov. 6, 2018. (Rick Egan | The Salt Lake Tribune) Mitt Romney gives his victory speech, 30 minute after the polls closed, at the Romney Headquarters, in Orem, on election night, Tuesday, Nov. 6, 2018. (Rick Egan | The Salt Lake Tribune) Mitt Romney visit with Danny Goode and his son Russell Goode, 7, at the Romney Headquarters, in Orem, as they wait for the polls to close, on election night, Tuesday, Nov. 6, 2018. (Rick Egan | The Salt Lake Tribune) Mitt Romney shakes hands with supporters at the Romney Headquarters, in Orem, as they wait for he polls to close, on election night, Tuesday, Nov. 6, 2018. (Rick Egan | The Salt Lake Tribune) Mitt Romney greets Roxanne and Steve Shallenburger, at the Romney Headquarters, in Orem, as they wait for the polls to close, on election night, Tuesday, Nov. 6, 2018. (Rick Egan | The Salt Lake Tribune) Mitt Romney shakes hands with Danny Goode and his son Russell Goode, 7, at the Romney Headquarters, in Orem, as they wait for the polls to close, on election night, Tuesday, Nov. 6, 2018. (Rick Egan | The Salt Lake Tribune) Mitt Romney greets Greg Klekes and Jessie Li at the Romney Headquarters, in Orem, as they wait for the polls to close, on election night, Tuesday, Nov. 6, 2018. (Rick Egan | The Salt Lake Tribune) Mitt Romney shakes hands with supporters at the Romney Headquarters, in Orem, as they wait for the polls to close, on election night, Tuesday, Nov. 6, 2018. (Rick Egan | The Salt Lake Tribune) Mitt Romney greets Jeff and Jason Hadfield, at the Romney Headquarters, in Orem, as they wait for the polls to close, on election night, Tuesday, Nov. 6, 2018. (Rick Egan | The Salt Lake Tribune) Mitt Romney shakes hands with supporters at the Romney Headquarters, in Orem, as they wait for the polls to close, on election night, Tuesday, Nov. 6, 2018. (Rick Egan | The Salt Lake Tribune) Mitt Romney shakes hands with Greg Klekes and Jessie Li at the Romney Headquarters, in Orem, as they wait for the polls to close, on election night, Tuesday, Nov. 6, 2018. (Rick Egan | The Salt Lake Tribune) Mitt Romney shakes hands with supporters at the Romney Headquarters, in Orem, as they wait for the polls to close, on election night, Tuesday, Nov. 6, 2018. (Rick Egan | The Salt Lake Tribune) Mitt Romney gives his victory speech, at the Romney Headquarters, in Orem, on election night, Tuesday, Nov. 6, 2018. (Rick Egan | The Salt Lake Tribune) Mitt Romney gives his victory speech, at the Romney Headquarters, in Orem, on election night, Tuesday, Nov. 6, 2018. (Rick Egan | The Salt Lake Tribune) Lt. Gov. Spencer Cox gives a speech at the Romney headquarters in Orem, on election night, Tuesday, Nov. 6, 2018. (Rick Egan | The Salt Lake Tribune) Gov. Gary Herbert gives a speech at the Romney headquarters in Orem, on election night, Tuesday, Nov. 6, 2018. (Rick Egan | The Salt Lake Tribune) Mitt and Ann Romney leaves the Romney headquarters after Mitt gave his victory speech, in Orem, on election night, Tuesday, Nov. 6, 2018. (Rick Egan | The Salt Lake Tribune) Gov. Gary Herbert gives a speech at the Romney headquarters in Orem, on election night, Tuesday, Nov. 6, 2018. (Rick Egan | The Salt Lake Tribune) Mitt Romney gives his victory speech, at the Romney Headquarters, in Orem, on election night, Tuesday, Nov. 6, 2018. (Rick Egan | The Salt Lake Tribune) Mitt Romney gives his victory speech, at the Romney Headquarters, in Orem, on election night, Tuesday, Nov. 6, 2018. (Rick Egan | The Salt Lake Tribune) Gov. Gary Herbert gives a speech at the Romney headquarters in Orem, on election night, Tuesday, Nov. 6, 2018. (Rick Egan | The Salt Lake Tribune) Mitt Romney gives his victory speech, at the Romney Headquarters, in Orem, on election night, Tuesday, Nov. 6, 2018. (Rick Egan | The Salt Lake Tribune) Gov. Gary Herbert gives a speech at the Romney headquarters in Orem, on election night, Tuesday, Nov. 6, 2018. (Rick Egan | The Salt Lake Tribune) Mitt and Ann Romney leaves the Romney headquarters after Mitt gave his victory speech, in Orem, on election night, Tuesday, Nov. 6, 2018. (Rick Egan | The Salt Lake Tribune) Mitt Romney gives his victory speech, at the Romney Headquarters, in Orem, on election night, Tuesday, Nov. 6, 2018. (Rick Egan | The Salt Lake Tribune) Ann and Mitt Romney pose for a photo with Gov. Gary Herbert and his wife Jeanette, and Senator Mike Lee and his wife Sharon, after giving his victory speech at the Romney headquarters in Orem, on election night, Tuesday, Nov. 6, 2018. (Rick Egan | The Salt Lake Tribune) Mitt Romney gives his victory speech, at the Romney Headquarters, in Orem, on election night, Tuesday, Nov. 6, 2018. (Rick Egan | The Salt Lake Tribune) Mitt Romney gives his victory speech, at the Romney Headquarters, in Orem, on election night, Tuesday, Nov. 6, 2018. (Rick Egan | The Salt Lake Tribune) Lt. Gov. Spencer Cox gives a speech at the Romney headquarters in Orem, on election night, Tuesday, Nov. 6, 2018. (Rick Egan | The Salt Lake Tribune) Mitt Romney gives his victory speech, at the Romney Headquarters, in Orem, on election night, Tuesday, Nov. 6, 2018. Mitt Romney will be the next U.S. senator from Utah, with unofficial election results showing the former Massachusetts governor and two-time presidential candidate easily outdistancing his Democratic opponent, Salt Lake County Councilwoman Jenny Wilson. After vote totals late Tuesday, Romney held a 28 percentage-point lead with 61 percent of the vote, compared with 33 percent for Wilson. 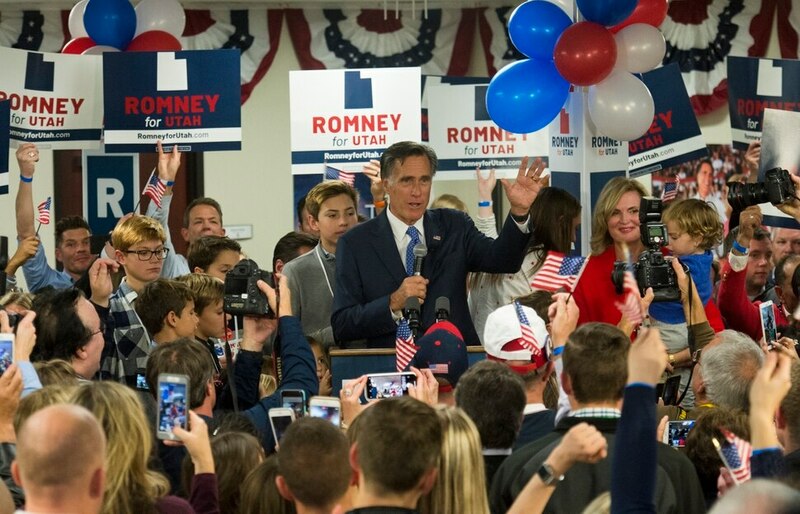 At Romney’s campaign headquarters in Orem, cheers and applause erupted shortly after 8 p.m., when polls closed and national media outlets projected a win for the Republican, a former leader of Salt Lake City’s 2002 Winter Olympics. In a victory speech, Romney praised Wilson for running a strong, positive campaign. “I admire her," Romney said, “and I wish her and her family a great deal of success." (Rick Egan | The Salt Lake Tribune) Mitt Romney shakes hands with supporters at the Romney Headquarters in Orem as they wait for the polls to close on election night, Tuesday, Nov. 6, 2018. Romney was considered the favorite for the seat of retiring Sen. Orrin Hatch, R-Utah, since before the formal declaration of his candidacy, as rumors had swirled for months that the nationally known Republican was considering a run for the Senate in Utah. On Twitter, Washington Post reporter Matt Viser noted that Romney will be the first U.S. politician in 173 years to serve as governor of one state and U.S. senator from another. “Last to accomplish the feat was Sam Houston,” Viser wrote, “who was Tennessee governor before his legendary exploits in Texas, where he also won election to U.S. Senate in 1846." On the campaign trail, Romney repeatedly stated that his priorities include reduction of the national deficit and a return to traditional budgetary procedures. He also has advocated for immigration reform, pitching a merit-based system combined with a physical barrier along the U.S.-Mexico border and legal protections for the so-called “Dreamers,” a group of U.S. residents who were illegally brought into the country as children. Romney reiterated those priorities in his election-night speech and described his victory as a call for greater dignity and respect in national politics. Wilson, speaking before a gathering of Utah Democrats at a Salt Lake City hotel, said she leaves the race proud, pleased and grateful. “I’m proud to be part of a legacy of women leaders,” she said. Romney’s win was part of a good night for Republican Senate candidates nationally, who retained majority control of the chamber. Romney has said that he will support the president when Trump and his administration are advancing the interests of Utah and the nation but is not opposed to condemning instances of racism, sexism and bigotry — if and when they occur. Also at Romney’s victory party were Utah Gov. Gary Herbert and Sen. Mike Lee. Lee predicted that with Romney and a continued Republican majority, the Senate would accomplish great things. Final and official vote totals will be released by the Utah Lieutenant Governor’s Office later this month after a canvass of county and state election results. Cara MacDonald and Zachary Aedo contributed to this report.